Flaxseed meal comes from ground flaxseed. They can come brown, tan, or golden in color. It is identified as a superfood. Although they can be consumed in whole form, ground flaxseed is more beneficial because of the bodies ability to digest and absorb the nutrients more easily. 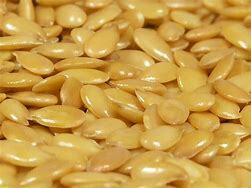 Flaxseed is known to have multiple health benefits. It absorbs lots of water and is mixed well with coconut flour, adding additional moisture to recipes. How To Make Your Own: Take whole flaxseed, place in high output blender, food processor, or coffee grinder and grind until fine. In a bowl, mix ground flax meal and seasonings well. Add water and mix till combined with a spatula. Cover and set the dough aside for 10 minutes. Place the rolled dough with parchment paper onto a baking sheet and use a pizza cutter to cut into cracker sized pieces. Bake chips for 10-15 minutes (longer if thicker). Allow crackers to cool completely before storing. You can adjust seasoning according to what you like. I like mine a little spicy so I add a chili powder mix of cayenne, chili, cumin, and paprika. These chips are perfect as a dip or a high fiber snack.